As I mentioned in my previous post, we spent the first three nights of our Malaysia trip in KL, staying with my brother's girlfriend, the awesome Su. (Hi SU!) Because this was my first non-family trip to Malaysia, we had a much more active holiday than I'm used to - lots of walking and sightseeing. Normally when I go with my parents we just shop and eat. Aah... the true Malaysian pastime! 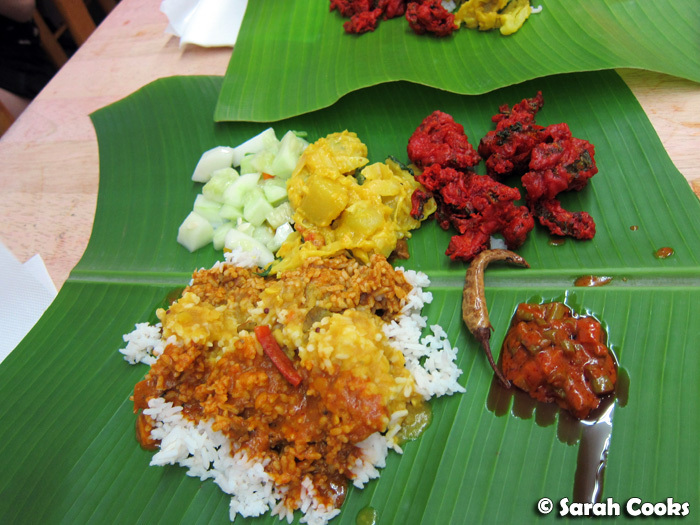 Today's post is focused on all the Indian delights we enjoyed whilst in KL. 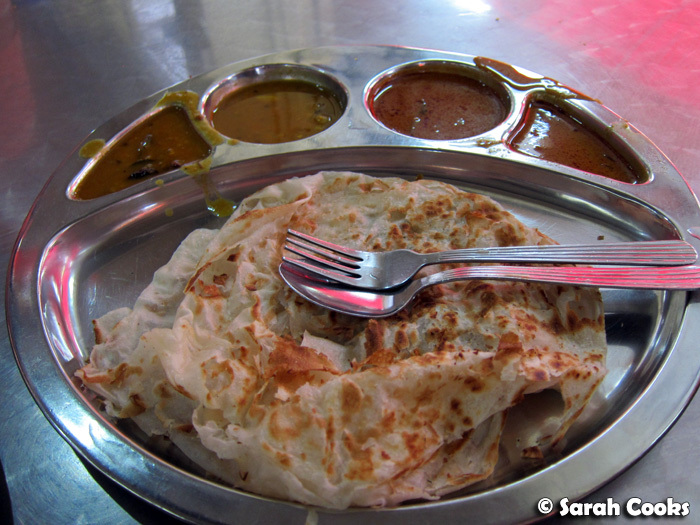 Whenever I go Malaysia, the first stop has to be for roti canai. 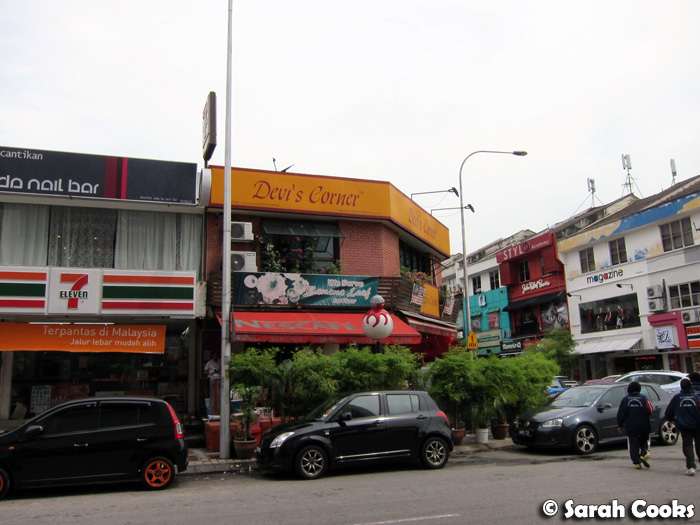 Devi's Corner in Bangsar was an awesome destination for our first Malaysian breakfast! We absolutely gorged ourselves on different types of roti (all cooked to order), and funky drinks. 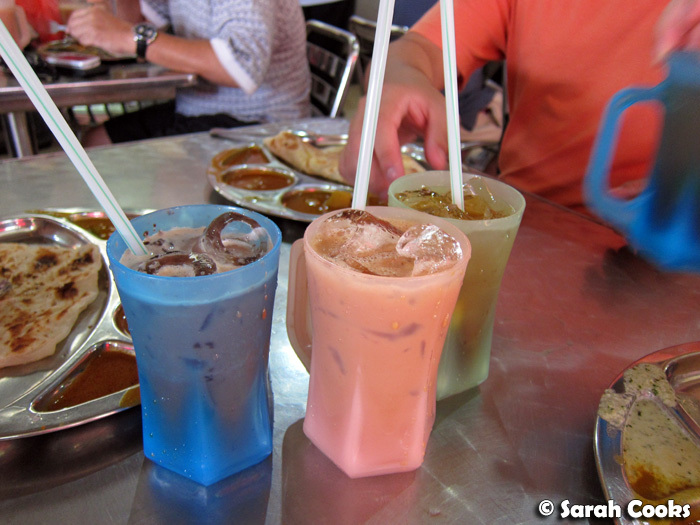 We had milo ais (iced milo), teh ais (iced tea) and teh o ais limau (lime ice tea). Don't forget to ask for your drinks to be kurang manis! (This means "less sweet" in Malay.) Standard drinks in Malaysia are crazy, super-duper sweet! 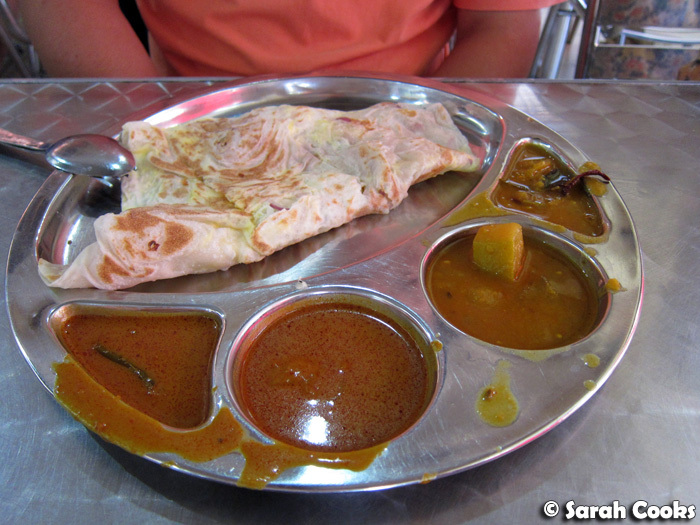 The classic roti canai, served with various curry sauces - fish, chicken and dahl. Mmm... flaky goodness! Same as above, but with egg and onions. I'd never had paper tosai before, but loved the light and crunchy texture. 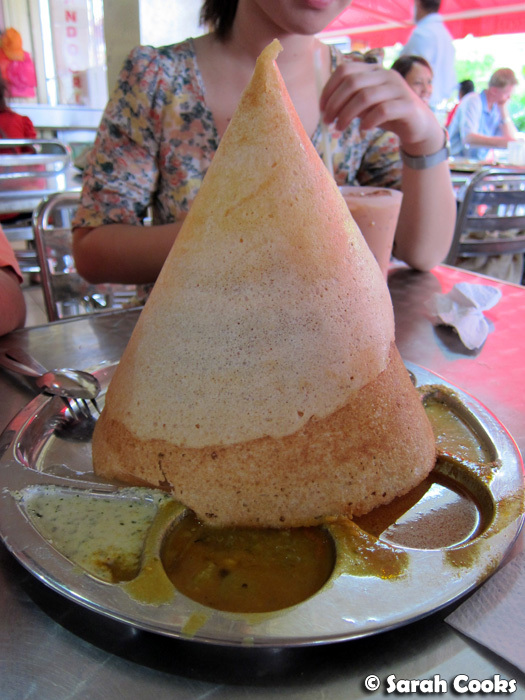 This one also came with different sauces, including a delicious coconut chutney/sambal thingo. Devi's seem to be open pretty much all the time - lunch, dinner, late night suppers, and more! 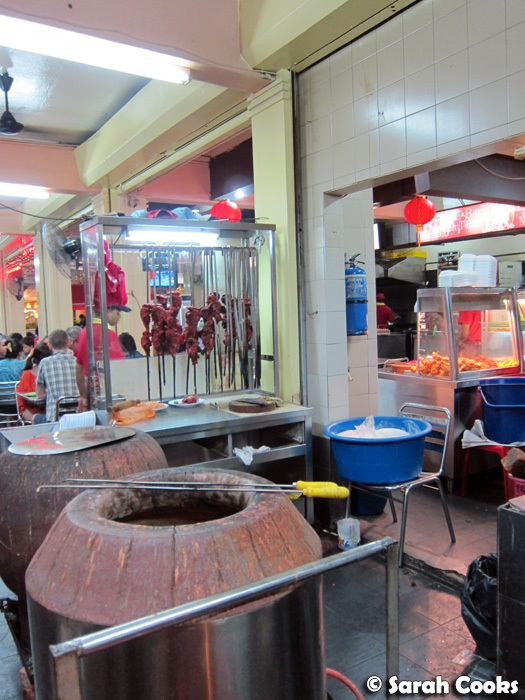 They also do a mean tandoori chicken and fab chappatis, which we had on our last night in KL before we left for the airport. 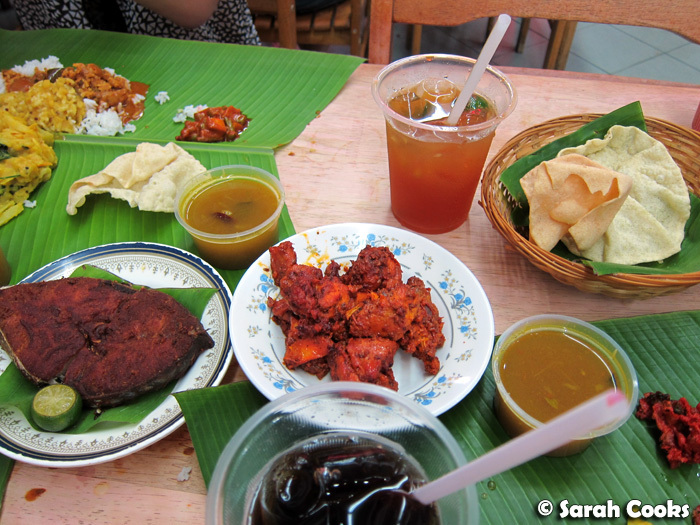 Also in Bangsar, Sri Nirwana serves up awesome banana leaf. There's always a big queue, but it seems to move quite quickly! When we visited, the sides were a cucumber salad, a potato and cabbage curry and crunchy deep-fried bittergourd pieces. 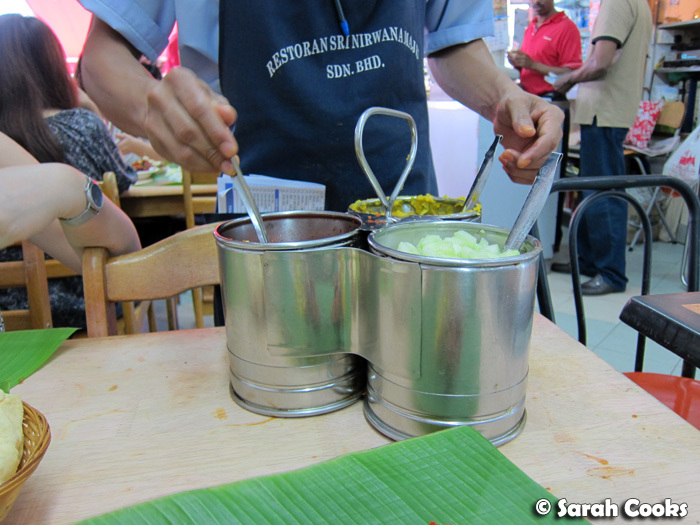 They also come around with salted chillis, and pour curry sauce (chicken, fish, whatever) directly onto the rice. We ordered fried ikan tenggiri (mackerel) and chicken masala to go with. Those little tubs of soup are called rasam, which is very rich with spices. Apparently it's very nourishing and health-giving - good if you've got a cold or are feeling run down. 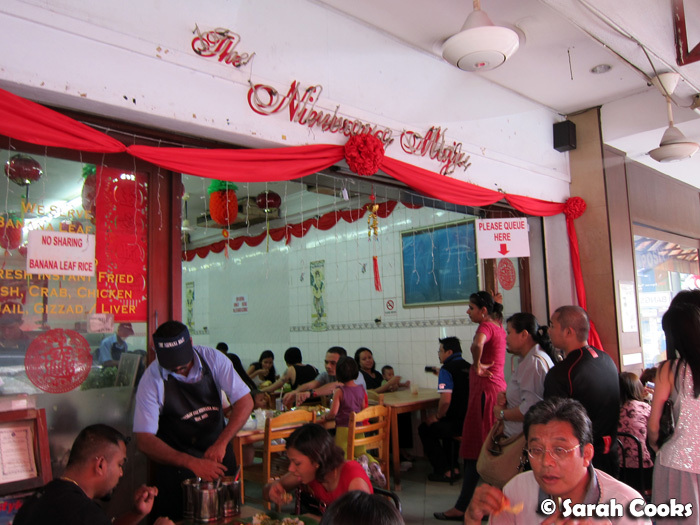 You can also see another teh o limau ais in the background! 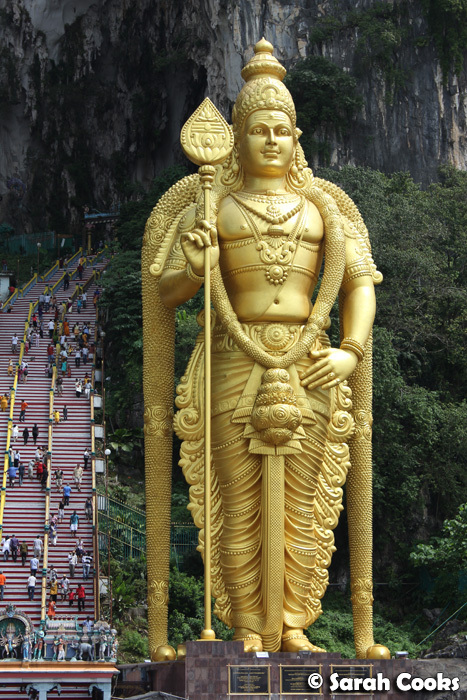 I'd never been to the Batu Caves before, and was fascinated to see the series of Hindu temples and shrines built in the caves of the limestone hill. Although I must say that climbing hundreds of stairs in Malaysia's heat and humidity was not my idea of a fun afternoon! (I'm sure I was overheard saying more than once: "Why can't we just go to a mall and drink Coffee Bean?!") The climb was definitely worth it though. Inside the cave itself were many shrines, people singing religious songs and worshiping. We saw quite a few people carrying small kavadis, and making offerings. The Batu Caves is the focal point of Thaipusam, and I'm told during the festival, it gets absolutely packed with worshipers carrying massive kavadis, and onlookers. I'm sure it would have been an amazing sight. Unfortunately, even though we were in Malaysia during Thaipusam, due to our flight timings, we missed both the Penang and KL festivals. Boo! 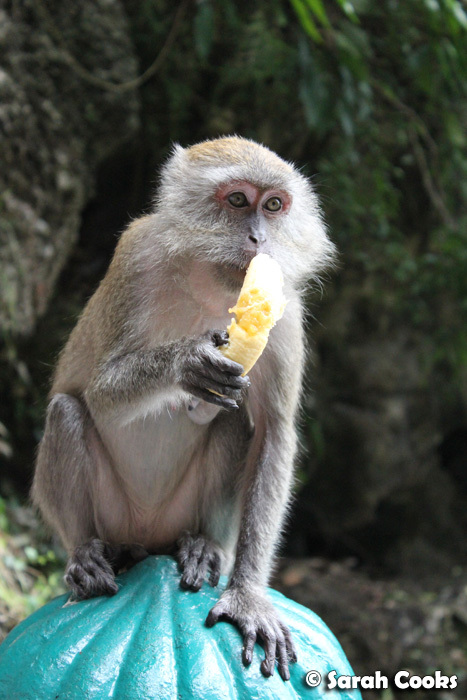 The Batu Caves are also famous for their monkeys! There are loads of them, all the way up and down the stairs and the surrounding trees. They're super cute but can be very cheeky - stealing food and things like that. We saw one monkey eating chips from a packet while we were there! This one just ate a banana. 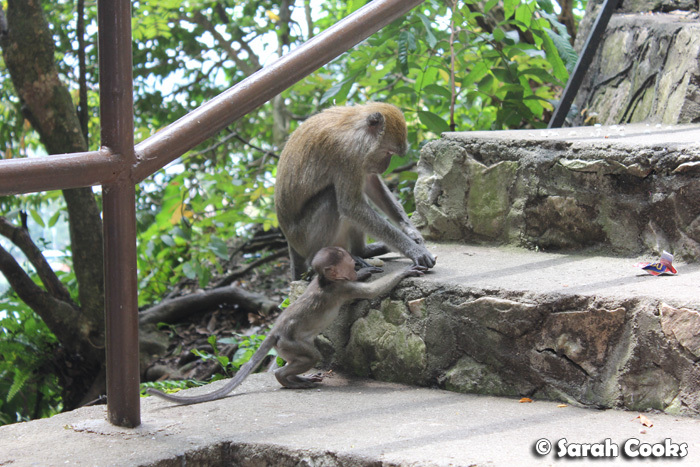 It saddened me to see many tourists hassling the monkeys - pulling on their tails and squealing. Aiyo, how can?! Apart from being cruel, it's just dangerous - this area is home for the monkeys, and of course they'll bite and scratch to defend themselves. Grr! Anyway, off my soapbox now. Check out this adorable BABY MONKEY! 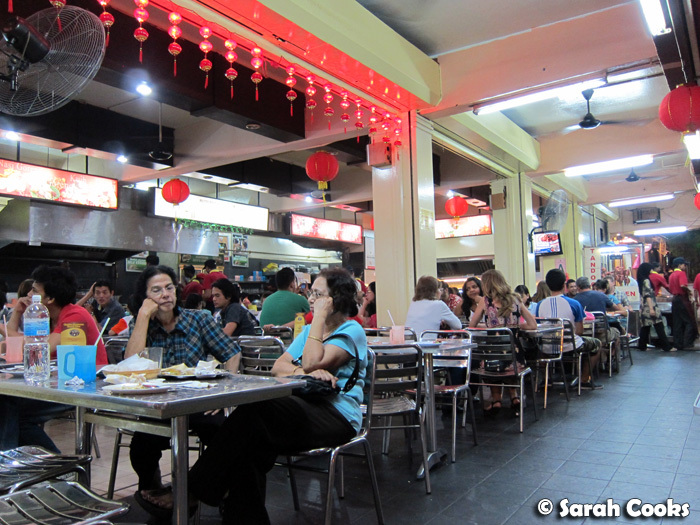 This is the first post from my series: 2012 Trip to Kuala Lumpur. Reminds me of the monkeys in Bali. They are so used to people (maybe even some are their relatives haha!) and have no fear trying to steal food. You should be applauded for walking all those steps in the heat and humidity! KKpills - Of course one! I am also nostalgic for all that awesome food!